Restaurant kitchens can be a hotbed of chaos. Servers darting in and out, attempting to grab that last-minute request from a guest. Sous chefs frantically rushing to complete orders. Expediting teams shouting out orders and requests. In all of this activity, it’s almost impossible to avoid accidents once in a while. While the incident usually tends to be minor – perhaps some spilled dinner or a broken dish – there are times when bigger problems occur, such as a fire. In the event of a flare up, fire suppression systems are built to provide you with a series of immediate reactions. This could include everything from activing a pressurized agent storage container, shutting down power and fuel to appliances and even triggering a fire alarm throughout the building. These fast notification options provide you with the most time possible to stop a small incident before it becomes devastating to people or business assets. Maintenance for your system is one of the most important offerings from AAA Fire Protection. In our 40+ years of service to California businesses, we have seen first-hand the problems that can occur from the lack of a formal maintenance strategy. Fortunately, our team will work with you to ensure that your business is fully covered both now, and in the future. If you’ve been working with another fire protection organization, a review may show that your system could use some updates. Don’t be alarmed, this is completely normal! Fire protection options change over time, and if it’s been a while since your system received a complete overhaul or cleaning, you may be in need of some attention. Even at times when your staff is at a minimum, your fire protection system is on guard against kitchen dangers. 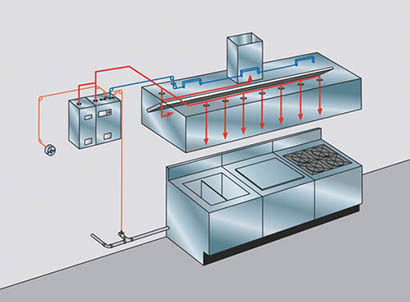 The systems that AAA recommends are easy to install and maintain, allowing you to reduce the downtime required for your fire suppression system. 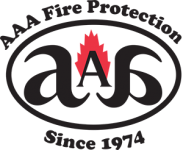 Contact the professionals at AAA Fire Protection today to learn how we provide fire protection for California businesses of all sizes. Call us today at 855-778-7808 or check out our customer testimonials online.